Prayer….Access to the Source of Power! Did we get that? It is in Jesus’ name that we must present our prayers to our Heavenly Father! What a privilege and a gift HE has given us! He sacrificed His very life so that we can have ACCESS to our CREATOR! He overcame the world so that we might experience a joyfully abundant life! But first, before we take our requests before Papa God we must put into practice the act of forgiveness. We must harbor no hatred in our hearts towards anyone. This is not an option; it is a command from the One who forgave our very own sins unconditionally. How can we do less! In Mark 11:25 we’re told, “But when you are praying, first forgive anyone you are holding a grudge against, so that your Father in Heaven will forgive your sins too.” And in 1 John 1:9 we read, “But if we confess our sins to Him, He is faithful and just to forgive our sins and to cleanse us from all wickedness.” When we exercise genuine forgiveness, God is receptive to our prayers! We must let go of the past. We must forgive in order for His Spirit to flow freely within us, and to be in-step with our Savior Jesus Christ! In John 15:23, Jesus gives the command: “Love each other in the same way I have loved you. There is no greater love than to lay down one’s life for one’s friends. You are my friends if you do what I command.” What a privilege to be called the Master’s friend! Let’s not waste a minute of His time. Let it be a time to treasure. There are two verses in Scripture that speak volumes to me each time I read them. The first is in Psalm 139:23-24: “Search me O God and know my heart; test me and know my anxious thoughts. Point out anything in me that offends you, and lead me along the path of everlasting life.” This is my heart’s desire…to have Papa God right smack in the middle of my business! I want Him to search me…to test me…and to purge any foul and unholy thing that is displeasing to Him. I want integrity to be the word God uses when He describes my character…as in 1 Chronicles 29:17, “I know, my God, that you examine our hearts and rejoice when you find integrity there. You know I have done all this with good motives, and I watched your people offer their gifts willingly and joyously.” I know I’m not perfect, but my heart’s desire is to be the woman that God originally designed me to be! I will falter and stumble from time to time, but I know that I have a patient and merciful Father. His grace is my sufficiency. 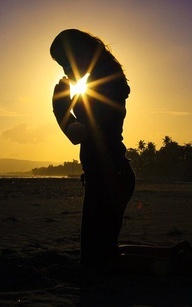 Lastly….remember that prayer is a SACRED action! It blows my mind to think of all the prayers that must be going up to Him at once. His omnipresence…His Holy presence everywhere all the time…is unfathomable! So with all this being said, the next time you and I spend time with Papa God, let us value it like priceless treasure. Let’s not fill it with mindless, selfish chatter. Instead, let us come before Him with a humble, reverent spirit. Remember…He isn’t interested in our eloquence; He is interested in the sincerity of our heart. I squandered several years of my life because of my deceptive and self-destructive ways. I perverted the precious gift of life, and I was compelled to live in the shadows of guilt and shame. I hurt people by my foolishness. I felt as though I had disqualified myself from ever finding real peace and meaning in my life. But…God invited me to come back home to Him. And I accepted the invitation. I was given yet another chance. By His grace He has healed my heart. And He has not only restored my life, but He has given me an Abundant Life…far beyond anything I ever imagined…and far beyond anything I deserve. That’s His Amazing Grace! And I am astounded that He has invited me to share in His Plan here on earth. I get to tell my story of mind-boggling peace…and of a purpose that is eternal. The good news is that He loves to forgive us and restore us to a relationship with Himself. He only asks that we admit to our need for Him, and humbly ask for the gift of His grace in our life, and receive the New Life He has prepared for us–Eternal Life that begins the very moment we are set free by our amazing Creator!